Author’s Note: Hi everyone! We’re kicking off Round 9 with the Holloway family! As you may have figured out by now, each household takes two weeks to get through in a Round, but the number of chapters varies. After 12 long and crazy Epstein chapters, I think we all need a reprieve. So the Holloway family’s story for this round is told in just four chapters! I’m also throwing in two pen pal letters, so the update schedule for the next two weeks is M-W-F. Enjoy! Luca and Liz Holloway were married for enough days now that they settled into a pattern. Most nights, Liz could be found in her orchard. That timing worked out because Luca worked nights. The issue was that she would go out to the orchard around 10PM each night, even when Luca was off. He wasn’t sure how to encourage her to spend more time with him on his days off, but he knew he would figure it out. Liz’s orchard took many hours of work, but she loved it. She hadn’t done much to the inside of the house to make it her own, but the outside was her domain. Under the bright Windenburg stars, near the soft light of the glowfruit trees, Liz was home. 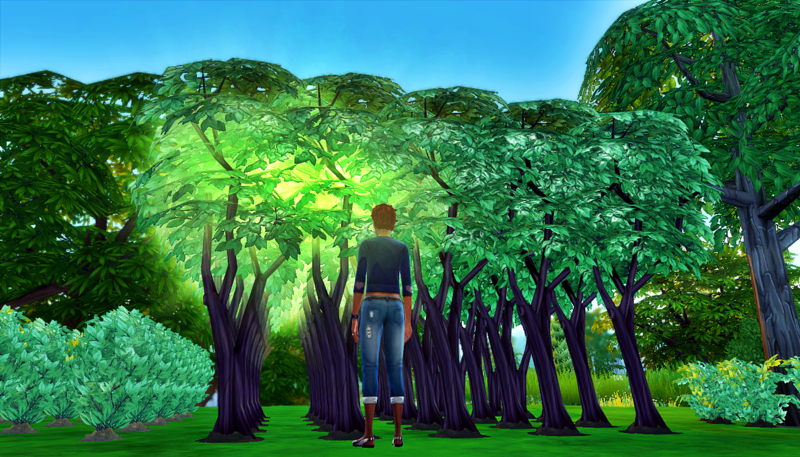 Sometimes she stayed in her orchard all night, not paying attention to the time until the sun’s light competed with the glow fruit trees. Liz: This is living! Hard work, bountiful harvests, all under a gorgeous blue sky unbroken by high rises. I still can’t believe I get to have this every day. After finally pulling herself away from her beloved trees, berries, and flowers, Liz changed to go for her morning run. 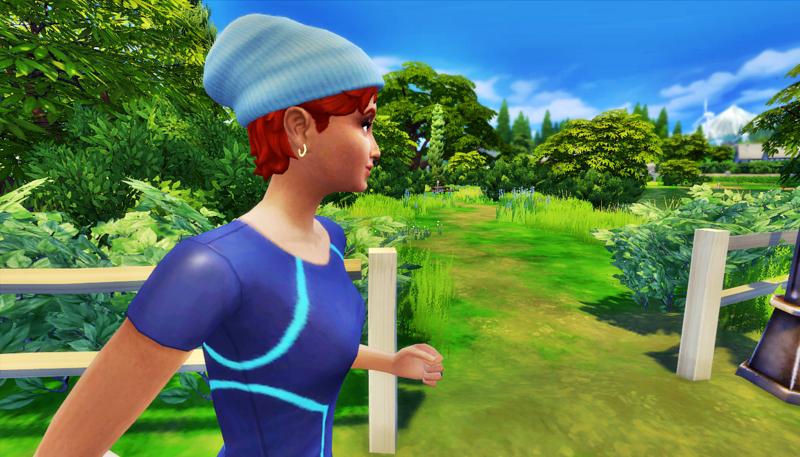 She had so much energy, so she always went for a run, even after staying up all night watering and weeding plants. She ran down the hill from her house, enjoying the sounds of nature as her feet hit the pavement. She passed by a grassy area that was fenced in. The river that cut across the coast of Windenburg could be access through this area. Liz: I should take Luca on a picnic here one day. I bet he’d love it. We could go fishing! And there’s a bush there too, in case we get frisky. And I–no he–could grill up whatever fish we catch. Oh, it would be an ideal day! Liz felt like she could run forever through the winding roads, accompanied by the sounds of their few neighbors starting their days. But unfortunately, her growling stomach would be put off no longer. She reluctantly headed home to forage for breakfast. Liz got back home and went straight for the fridge. She pulled out one of Laurel’s Purim cookies. Luca was awake as well, but he had not had breakfast yet. 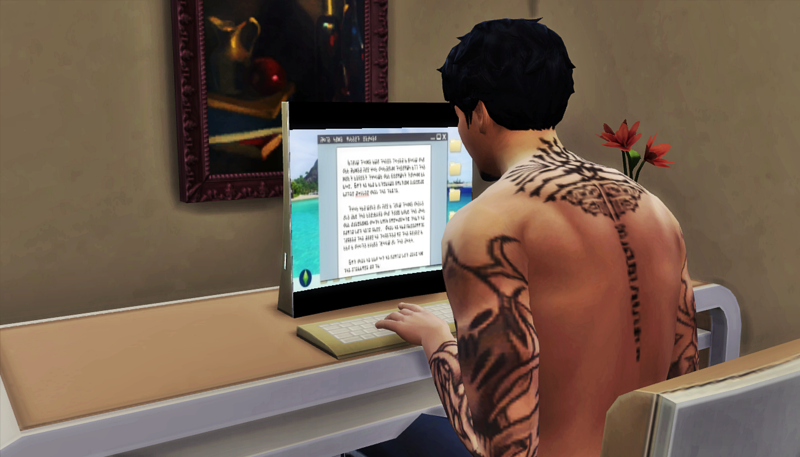 He was in Daniella’s old bedroom, using the computer. He heard Liz come in, so he rushed to finish what he was doing before she came looking for him. If Liz walked in, he had a screen up that made it appear he was working on jokes for his Comedy skill. But in fact, he was sending an e-mail to Daniella and Laurel, asking if one of them could please teach his wife to cook or please help refine her palate. Meanwhile, Liz was still eating the Purim cookie, judging Laurel’s cooking. Liz: I do NOT get why everyone says Laurel is such a good cook. This cookie is not at all tasty! Luckily I have good manners and a strong stomach, so I’ll just force it down and count it as breakfast and keep my opinions to myself. Liz finished the cookie just as Luca entered the main room, having showered and dressed for the day. 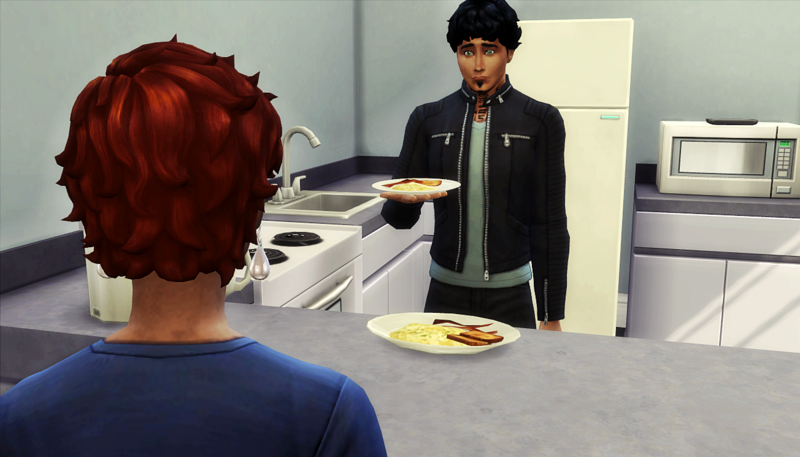 Luca prepared breakfast for himself–and second breakfast for Liz–then grabbed a plate for himself. Luca felt like he’d been doused with cold water. 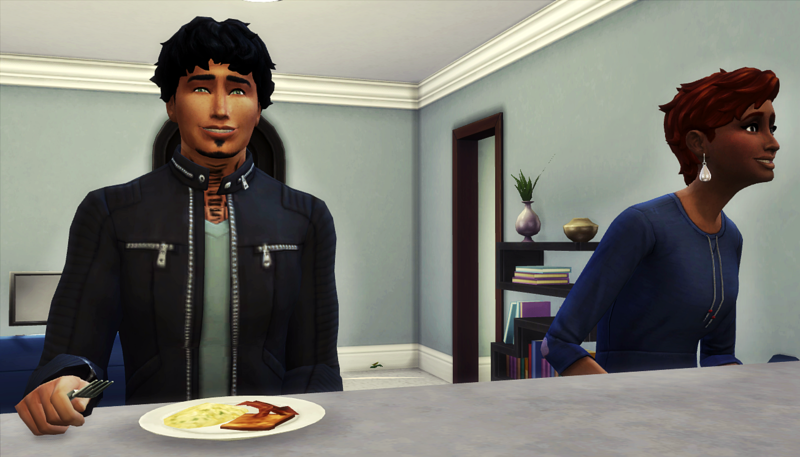 Not only did he have to cook his own food, but he also had to be reminded his life was about to be officially half over. He still felt young, so he didn’t understand what the fuss was about a birthday. And he didn’t know Liz preferred him with clothes on. She met him shirtless, but she wanted to change him? Luca’s ears were definitely on delay. Before her words caught up to him, he’d already agreed to the party. He picked up his fork to finally eat, smile still plastered on his face, confusion brimming inside. Luca: Wait, what did I just agree to?? Liz: He’s so sweet to let me plan everything. This will be fun! Next postAuthor’s Note #11: The Liebster Award! Lol @ your sarcastic response to Liz. She lives in her own alternate reality, I swear. 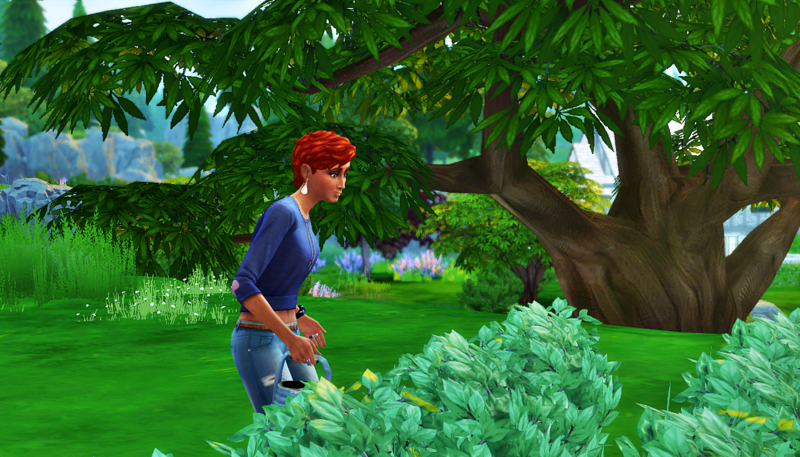 Okay, firstly, I loooooved your screenshots of Liz in the orchard! Secondly… OMG. These two… Talk about communication issues. And she’s so dang clueless she doesn’t even realize it! Ughhh! Even when people are communicating well, there are still slightly different perceptions of the conversation. I’m hoping to show that with the thoughts of my characters. HA! Poor guy. And, bruh…your wife should be one of your favorite ladies! Lol, poor Luca?? That was kind of the point of this chapter I think. Everyone was so worried about Liz (rightly so though…), but I wanted to show that Luca also got a bit of a bad deal in this marriage. She better be! “My two favorite ladies.” HA! Hopefully it was more a bit of flattery to get what he wants lol. I can see the demise of Liz and Luca on the horizon. Have seen this coming since they met. LMAO! Oh you’ve seen their demise, have you?? *snorts* keep reading. I love her so much ! She’s now my favorite! And as long as she’s got those lips, I think she and Luca will be just fine! And dang! Your writing is just singing ! Feels like you have hit your stride! Oh wow, thanks! I really appreciate the compliment about my writing. I’m so amused that Liz is your favorite. She’s such a sweetie, but poor thing has no idea what’s she’s signed up for. I thought at first that Luca was going to be bossing her around and she’d feel like a scared church mouse all the time, but it is NOT working out that way. It seems that Liz is taking charge more, haha. Clueless!!!! Augh! I have a bad feeling about this union. They are on totally different pages. You’re right. Completely different pages! And I can’t even blame this on communication because Luca has never had an issue expressing his dissatisfaction before. Something about Liz has him all clammed up. Should be interesting to see how long he can stay repressed like this.